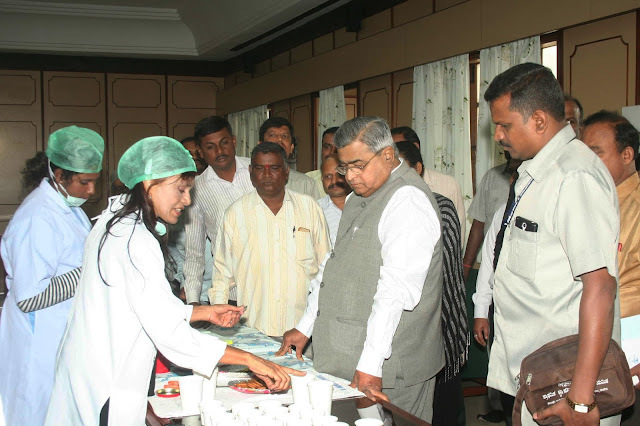 Dr Sunita Rana Agarwal of Dr Agarwal Hospitals conducted Free Eye and Gene Therapy Medical Camp for Vidhana Soudha officials Bangalore. The camp was inaugurated by Shri. K B Kodiwal, Honorable speaker Karnataka Legislative Assembly. 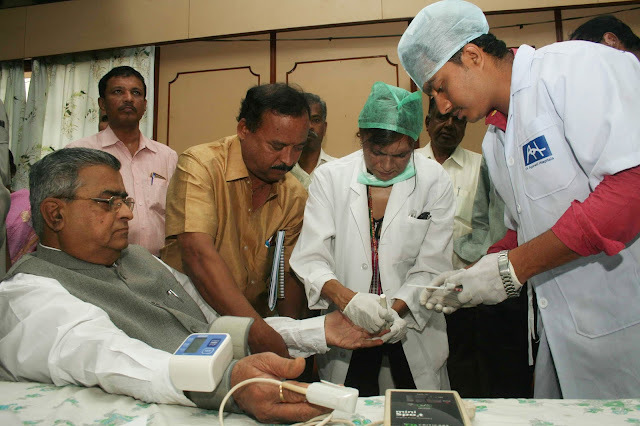 India 17 September 2016: DR.AGARWAL HOSPITALS AND GENE RESEARCH FOUNDATION have for the last century been conducting free health camps all over the nation and in troubled zones all over the world. For the first time in the glorious history of Vidhana Soudha a non government organization conducted a free eye and Gene Therapy Medical Camp. Over 150 patients were screened and given medical treatment. The mechanism of the free health and eye camps will be to register the persons give them a vitamin tablet, eye ointment, glucose biscuits, almonds, with some juice. A Danush (pain relief device) is placed on their phones so that it would reduce the impact of the mobile phone also negate vibrations of pain when used on the body. After a visual assessment, blood pressure would be taken. The next step is to take their heart rate and peripheral oxygen saturations. With all these readings a drop of blood is taken to make a random blood sugar test at the same time using one drop of blood to make their autologous immune booster injection. This is then injected in the arm of the patient in a subcutaneous route. Just one injection is sometimes enough though for chronic cases a course of injections would need to be given. 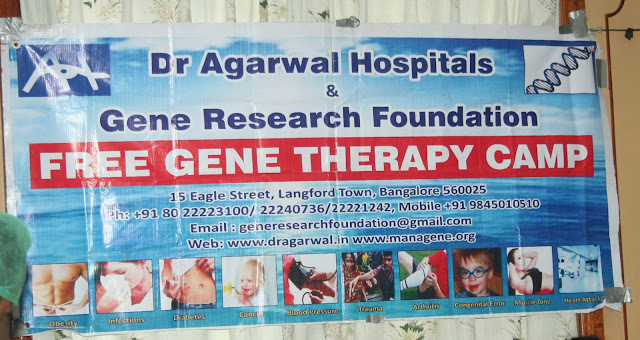 Dr.Agarwal Hospitals and Gene Research Foundation have pioneered many techniques in benefit of mankind and humanity one of the most important being the use of biological fluids and tissue for regeneration. Spearheaded by our beloved Late President Abdul Kalam in moving the research to the DRDO who described the DNA in the biological fluids to be amplified to treat diseases. The uses of biological fluids and tissues have been known for its restorative phenomenon, however matching the hosts to donor have held it back. When this can be done with autologous or taking from the same donor and giving the same host treatment options can be multiplied. Till this time autologous treatments have been reported with skin grafts and even corneal grafts with great benefits. The blood of a patient is the strongest biological information base tapping this great resource is what MANA THERAPY is all about. A drop of the patients own blood taken from the finger is used to manufacture the patients own treatment in lieu of their own DNA and all other protein bases. Since it is taken in the form of blood it is given back as parenteral treatment to the same patient. Over a period of 12 years and 15000 patients with each patient getting over 10 injections in one course where the raw stock comes from the same patient. Within a span of just one course of injections there is subjective and objective improvement seen.